UPDATED: April 9, 2014, at 12:14 p.m. Waiting in line for a coffee in the Science Center, Ben D. Sprung-Keyser ’15 decided to check the email that had popped up on his phone before heading to math office hours. “I thought it would be another boring email from a house mailing list,” he said. But, as he walked away with his coffee, he stopped in his tracks when he saw that it was a message informing him of his election to Phi Beta Kappa. Upon returning to his dorm, the surprises continued—Alexander L. Jaffe ’15, his roommate and friend since middle school, had also been elected to the organization. The two roommates make up one twelfth of Phi Beta Kappa’s “Junior 24”—the first 24 members of the Class of 2015 to be elected to the organization’s Harvard chapter. “The Junior 24 are among a highly select group of students recognized for extraordinary academic achievement,” wrote Jeffrey M. Berg, an assistant director at Harvard’s Postgraduate and National Fellowships Office, in an email announcing the selection on behalf of the chapter. Students who were selected for the honor were privately notified prior to the public announcement. Inductees were sitting on shuttles to the Quad, doing homework in libraries and dining halls, and walking to practice and class, but all said that they were surprised by their acceptance message. Many were relieved that the wait for an answer was over. Many juniors admitted to the organization attributed their success to a true passion for the subjects that they pursue, although they noted that every student’s academic path is unique. Many inductees also credited their success to the breadth of subjects and interests that their concentrations’ departments offer. Some had a clear idea of the concentration they wanted to pursue at Harvard, but most said that they came to their concentration after studying a wide range of subjects. 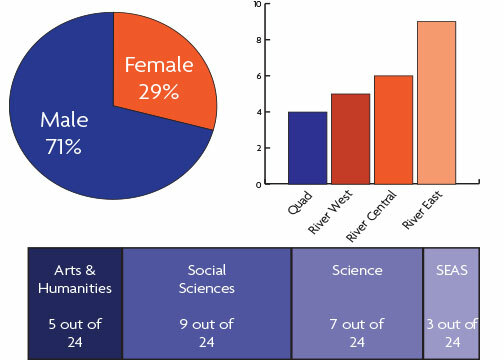 Thirteen of the 24 juniors came from just four departments: Mathematics, Psychology, Economics, and Social Studies. Four inductees concentrate in Mathematics, making it the most represented department in the group of juniors admitted to PBK. Math Department Chair Benedict H. Gross ’71 wrote in an email that this was “not unusual,” noting that the department attracts many strong students. When evaluating the purpose of a liberal-arts education, we think that fields such as ethnic studies provide critical opportunities for students to expand their views on the world. Using an iPhone application called Track Your Happiness, Harvard psychologists found in a recent study that daydreaming is associated with lower levels of happiness. Are humans selfish beings or is our first impulse to be cooperative?